A chassis for cheap shouldn’t imply cheap quality. Cooler Master’s new MasterBox MB600L helps back that notion up. It’s affordable, but not at the expense of design features we now demand. The MB600L has multiple cable routing options, a PSU shroud to keep things looking clean, and more for its modest $50 price tag. AMD’s Ryzen Threadripper CPUs offer a ton of performance, but that performance can sometimes come at the expense of higher temperatures. 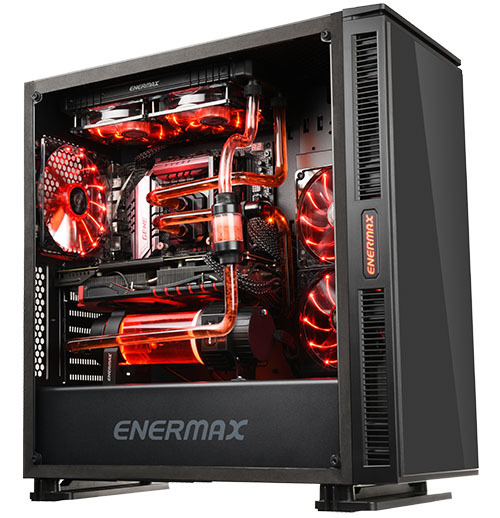 Enermax’s Liqtech TR4 280 aims to prevent heat from ever becoming a problem, though, thanks to its full TR4 coverage. Complementing that in our look is the Equilence chassis. Between them, Threadripper screams… but at a muted level. Having completed a new build for our gaming GPU test rig a couple of months ago, we didn’t want to waste time in following-up with another for our workstation GPU test rig. Wrapping itself around this build is Corsair’s Carbide 600C, and in this look, we’ll explore both the chassis as well as our new official benching rig in-depth. Modularity and customization are at the heart of PC building. With so many different components and needs, it’s hard to find a chassis that can do it all. Cooler Master’s MasterCase series aims to please as many builders as possible. Now with the MasterCase Pro 3, mini-tower builders now have something to work with. Let’s check it out in this review.